IT dealer Karsten Kristensen has recently begun selling Acronis Backup Cloud to his customers. But why? Read about the surprising advantages he’s experienced – for him as a dealer, and for his customers. “We had a different backup system, but then they raised their license prices. So we wanted to look into alternatives – and that’s when I heard about Acronis Backup Cloud through Liga,” explains Karsten Kristensen of the IT company &Rasmussen ApS. It’s a project-oriented IT company that also sells backups and hosting solutions to its customers – and it’s become an Acronis Managed Service Provider. “What appealed to us is that we didn’t need to have any standing hardware. That meant we could avoid having to drive to the hosting center at 2am because a server needed adjustment,” says Karsten Kristensen. But that was only one of several reasons. “Secondly, we weren’t forced to take a financial risk, because we didn’t have to start by buying an expensive basic license. We just pay for the space we actually use. That means the price we pay closely tracks our income. And that makes things so much simpler for us,” he says. What appealed to us is that we didn’t need to have any standing hardware. That meant we could avoid having to drive to the hosting center at 2am because a server needed adjustment. Now &Rasmussen ApS has been working with Acronis Backup Cloud for six months. And it has delivered solid benefits for both Karsten and the end-users. And then there’s the process when the customer actually needs to use the backup. “Before, the customer needed to call me and request a file from the backup, because it wasn’t something they were able to do themselves. 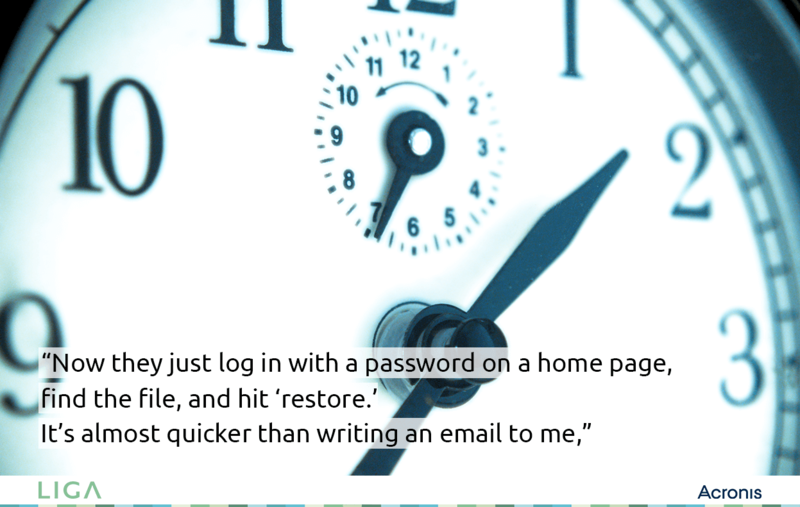 Now they just log in with a password on a home page, find the file, and hit ‘restore.’ It’s almost quicker than writing an email to me,” Karsten says. All in all, Karsten thinks that Acronis Backup Cloud has helped him eliminate 90 percent of the time he used to use on administration and servicing of customer’s backup solutions. Acronis Backup Cloud also has a feature many customers have requested: an integrated backup to customers’ mobile telephones. “The same code and the same system that backs up their PCs, and that makes it incredibly easy for them,” he says. Sign up for a test account and test how easy it is. – Up and running in no time.